The Cold Atom Laboratory (CAL) is a facility for the study of ultra-cold quantum gases in the microgravity environment of the International Space Station (ISS). It will enable research in a temperature regime and force free environment that is inaccessible to terrestrial laboratories. In the microgravity environment, up to 20 second long interaction times and as low as 1 picokelvin temperatures are achievable, unlocking the potential to observe new quantum phenomena. The CAL facility is designed for use by multiple scientific investigators and to be upgradable/maintainable on orbit. 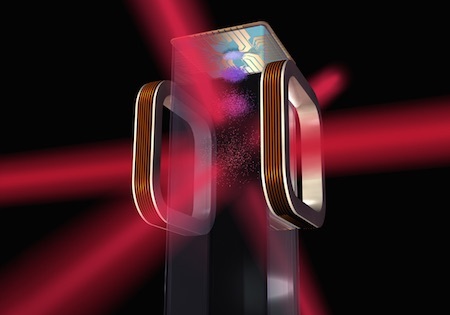 CAL will also be a pathfinder experiment for future quantum sensors based on laser cooled atoms. 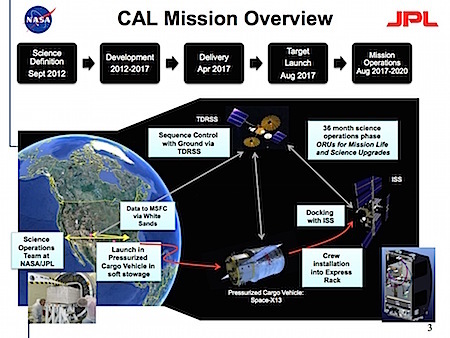 CAL is scheduled to launch in June 2017 on a Pressurized Cargo Vehicle in soft-stowage. After docking with ISS the CAL payload will be installed by astronauts into an EXPRESS (EXpedite the PRocessing of Experiments to Space Station) Rack inside the space station (upper picture). The EXPRESS Rack provides a standardized power, data, thermal, and mechanical interface to scientific payloads. CAL will occupy a quad locker space due to its size and power requirements. Following installation the payload will be operated remotely via sequence control from the Jet Propulsion Laboratory (lower picture). The initial mission will have a duration of 12 months with up to five years of extended operation. A white light began to wink on the ghost board. That would be the incoming line for Europa. Was somebody on that snowball in charge of this many-tentacled [robot]? "Hello, Europa... Is this your robot I'm looking at, in sector 94?" "That's me," the voice said. It was impossible to avoid thinking of it coming from the robot itself. "This is Doc Barth. How do you like my laboratory?" Via JPL, thanks to Jonathan Jeckell for the Twitter tip on this story.